The only outdoor exercise I continue through Winter is my Friday walk with a group of friends. There is a group of about 8 of us and we try and go every week regardless of the weather. If it is dry we walk a longer route but if it is cold an wet we cut it short and spend more time in the cafe at the top of the fell!. Having said that the short walk is around 6 miles long so we still get a decent outing. 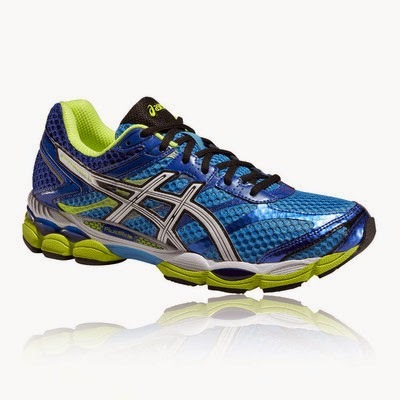 My trainers were getting very worn out so it was perfect timing when I was contacted by SportsShoes.com to see if I would be interested in reviewing a pair of ASICS trainers. After a lot of deliberation, as there are so many different pairs of trainers to choose from, I finally decided on the ASICS GEL-CUMULUS 16 Running Shoe. I exercise to keep myself healthy and also because I enjoy it, so my normal considerarations when I buy a pair of trainers are the fit, what they look like and whether they are suitable for the activities I do. To me having the right footwear for an activity is so important, as poorly fitting shoes at best mean discomfort and maybe having to cut short an activity and at worst may also cause injury. These days there is no need to compromise on style as there is so much choice in sportswear, we really can have it all - comfort, supurb performance and protection in kit that looks good too. After all when you are spending a lot of money on sports kit you want something you like otherwise if you don't like the look of it you just won't wear it. I have never bought a pair of trainers online before but I was really impressed with the information on the website and it really helped me to decide on a pair that would be perfect for me. In future I will look online as there is so much more information available than in the shops, unless of course you hit lucky with an unusually helpful and knowledgeable sales assistant - which rarely happens to me. Whilst I have thought about running I have never quite got around to it but receiving these trainers gave me the motivation that I needed to give it a go. 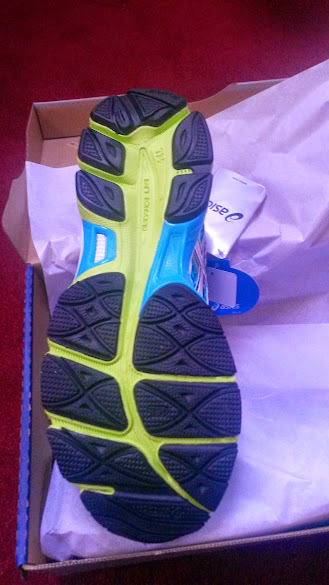 It would be very unfair to review a pair of running shoes and not actually run in them! Not being a runner I read through all the descriptions on the suggested shoes to see which would be the most suitable for me to choose. I have to admit that the style and colour played quite a significant part in my choice but the ASICS GEL-CUMULUS 16 Running Shoe seemed to have everything I wanted in a style and colour that I like and will wear. The trainers arrived a couple of weeks ago and I couldn't wait to get out and try them. I really didn't expect to get so excited about receiving a new pair of trainers but they looked so bright and new that I put them on straight away and had a quick run up the drive. I'm hoping that the neighbours didn't spot me as I was still wearing my work clothes which did look a bit odd with blue trainers but never mind! After my initial excitement I did think that before I tried proper running in them it would be best to wear them in a bit on one of my Friday walks. I was really surprised at how comfortable these were the first time I wore them. They fit like a glove and didn't rub at all. Having size 8 feet my feet can sometimes look huge in flat shoes so I was a little concerned about what they would look like in bright blue trainers. I needn't have worried, the brightness detracts from the size and I really like the look of them. I have been running a couple of times in them now and they are really comfortable to run in,. Reading the description on the website one of the main features of the trainer is that they incorporate FluidRide midsole technology which produces a more efficient and comfortable ride on longer runs. My half mile run, which I am gradually working on lengthening, isn't long enough to put this to the test but I am happy with the comfort up to now. They are comfortable to wear for a 6 or 7 mile fast walk so I am sure by the time I work up to a much longer run I will still be happy with them. I have also been using them when I have been cycling and they are easy to ride in. I do find it is much easier to get motivated to get outdoors and exercise if you have the right gear and SportsShoes.com have a huge range of products to make it easy for you. Brett Bannister, Managing Director at SportsShoes says "SportsShoes.com have a range of exciting new gear that will keep you warm and dry as well as adding a splash of colour to your day" and having browsed at their website I can certainly agree with his comment. I love wearing bright colours and I think my next purchase will be from their cycling section as they have a great selection of products at reasonable prices. 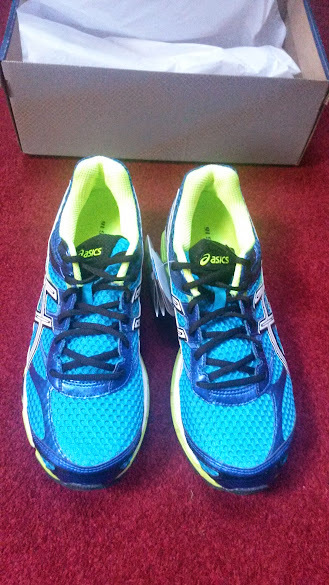 Disclaimer - I received the ASICS GEL-CUMULUS Running Shoes for the purpose of this review but all words and opinions are my own.